NATIONAL team member Andrew Kim Remolino of Talisay City flexed his muscles as Cebuano triathletes dominated the Ibayaw Bayawan Triathlon at the GK Village Park in Bayawan City, Negros Oriental on Sunday, Feb. 10. Fresh from a bronze medal finish in the National Age Group Triathlon (NAGT) in Subic Bay, the 18-year-old Remolino asserted his mastery in the standard distance race after completing the 1.5-kilometer swim, 40K bike and 10K run course ahead of the rest of the field to take the men’s overall title in the Ibayaw Bayawan Triathlon. It was a clean sweep for the Cebuanos as Kristiane Lim of Organique Acai Triathlon Team finished second followed by Talisay City’s Alfred Lathrel Pacabis. The Cebuano athletes also made their presence felt in the sprint distance race as Renz Wynn Corbin and Nicole Marie del Rosario topped the men’s and women’s divisions in the 750-meter swim, 18K bike and 5K run race. Cebuanos Charles Jeremiah Lipura and Earol Bilonguil finished at second and third to Corbin. The official times, however, were not available at press time. 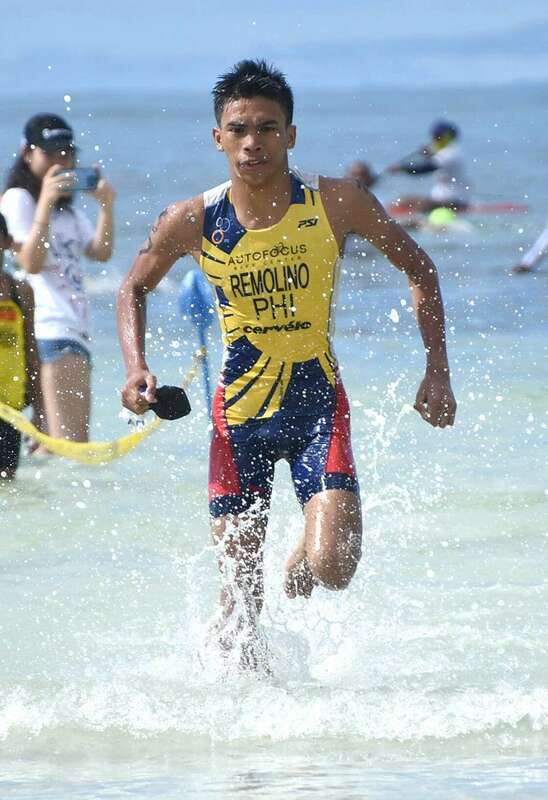 On the other hand, Remolino’s coach and father, Roland, told SunStar Cebu that his son was preparing for a race in Singapore dubbed as Super League Triathlon Singapore. “The Next race would be the Super League Singapore, which is a short-distance race. The race in Bayawan was part of our preparation,” said the older Remolino in Cebuano. Andrew Kim, a Grade 12 student of Paref Springdale School, will compete in the Under-19 race in Singapore. The race will cover a 300-meter swim, 4K bike laps and 1K run, according to the event’s website.